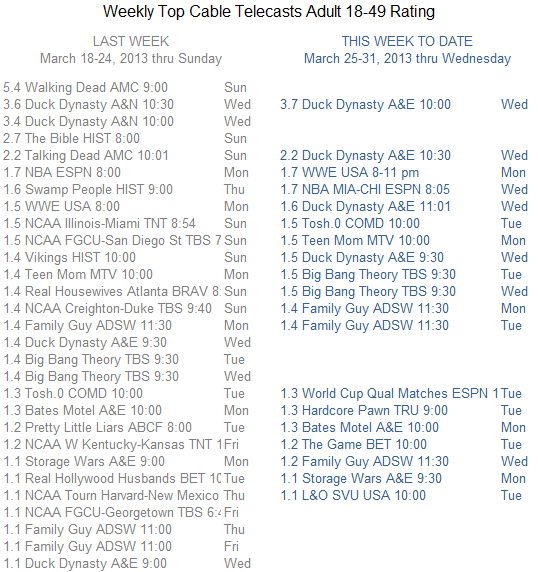 A&E’s Duck Dynasty sits atop the cable ranking of all telecasts midway through this week. Of course, we are saving the top spot for Sunday’s Walking Dead on AMC. Easter Sunday is one of those rare holidays that don’t really depress TV viewing — AMC should certainly run an original episode Sunday. The lists below show cable programs generally at a 1.1 adult 18-49 rating or higher. Repeat telecasts are shown selectively. Usually, the highest-rated Big Bang Theory or Family Guy episode on a given night is listed, while the others are left off to keep the ranking less cluttered. We’ll complete the current week’s ranking when Sunday’s official ratings are available Tuesday morning. Here is how this television week is shaping up, three days down and four to go. Updated weekly broadcast and cable program rankings.